Leduc Physio - Physical Therapy and Massage Therapy ServicesPhysiotherapyPainBeen Injured In A Car Accident ? Know Your Rights ! 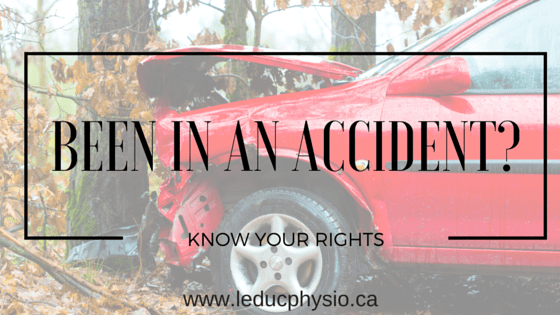 If you have been injured in a car accident, the details can be overwhelming. Often, you already have a headache after the accident, and the paperwork can just make things worse. Our blog post ” What to do after a car accident” can help to simplify the steps to take immediately after the accident. What is the PPN ( Preferred Provider Network) ? Preferred provider networks are not new to Alberta, but they are certainly becoming more popular among large insurance companies. What’s important to realize is that your insurance company may try and direct your care to a particular chain of clinics. Often these are large scale multi-million dollar corporations that have partnered with your insurance company in exchange for cost cutting services. While this is a good deal for your insurance company, it may not be the best deal for your recovery. This prearranged agreement may leave you with rushed appointments, premature discharging, and little attention to your personal needs. Even though your adjustor will try and recommend you use a clinic in the PPN, it is your right to choose any provide you want. 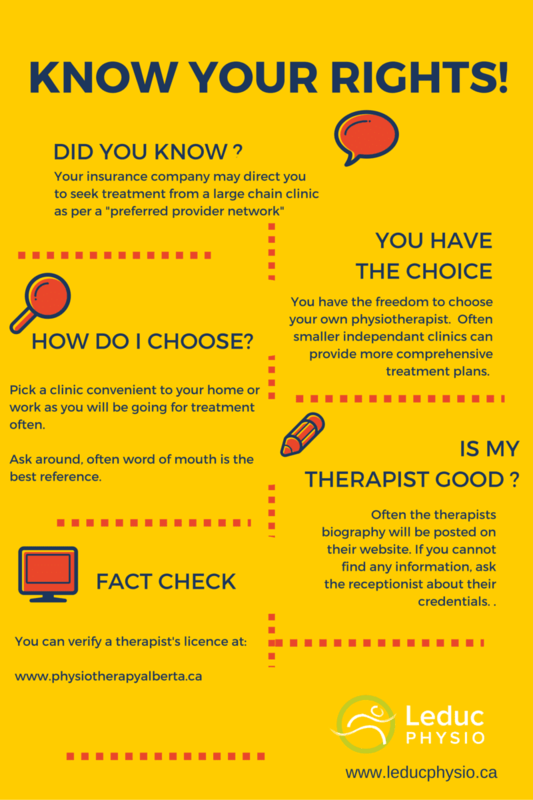 Take time to find a physiotherapist who will suit your needs. A good therapist will provide you with a variety of rehabilitation options such as manual therapy, manipulation, acupuncture, IMS, stretches, and restorative strengthening programs. A great therapist will take the time to listen to your concerns, reassess your injuries often, and fine tune your rehabilitation according to your needs. Make sure your concerns and needs are being met by your therapist and you feel comfortable discussing your progress and goals for therapy. Help ! I've Been Injured In a Car Accident. What do I do?